Mix the hoisin sauce, ginger, garlic, onion and white wine together. 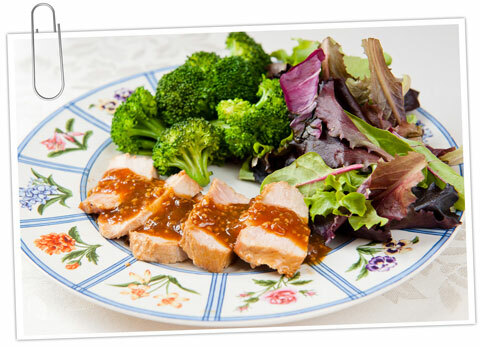 Place the pork tenderloin in a baking dish and spoon the hoisin marinade over it. Let the pork marinate in the refrigerator, covered, for 6 to 12 hours. Preheat the grill to medium or preheat the oven to 425 degrees. Grill the pork, turning once, or bake it until the inside has lost its pink color, about 25 minutes total.” Pork tenderloin is versatile, quick to cook…and a great diet food. Ounce for ounce, it has no more fat than chicken breast.